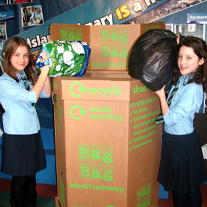 Raise funds for your school with textile recycling. Driver has the right to refuse collection of bags if they are deemed unsuitable for collection. Sign up now and get our free Rag Bag Starter Pack which includes everything you need to start recycling. The 'Rag Bag' recycling scheme has been developed to provide regular fundraising for schools in Scotland. The scheme is completely FREE, and your school will be paid for every kg recycled. You can raise hundreds of pounds with every collection made! 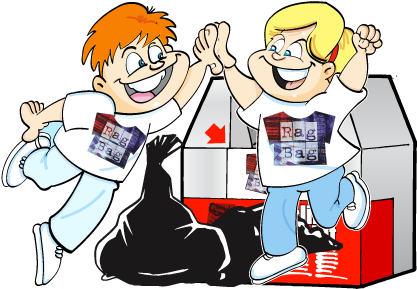 "We have been involved with Rag Bag since 2007 and have found it an excellent way to raise funds to buy resources which have enhanced the children's learning. To date the money has helped us buy various equipment such as Adventure Playground, Eco Work, SMARTBOARDS, Books, Games, Educational Trips and much more." We have always found the staff very helpful and collections are generally prompt."